Near perfect weather and several new booths attracted record attendance at the 2010 Boulder Jewish Festival on Sunday, June 6th. In addition to the large crowds, Congressman Jared Polis, D-Boulder, Denver Mayor and Democratic Colorado Gubernatorial Candidate John Hickenlooper and Democratic US Senate candidate Andrew Romanoff all put in appearances. 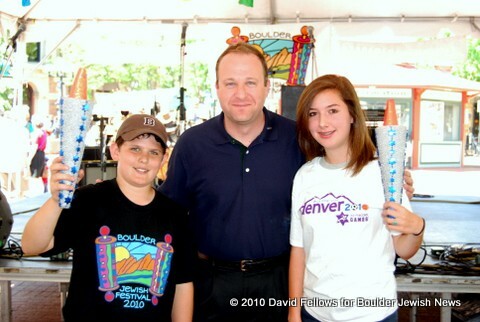 Polis addressed the crowd at the Main Stage in the morning, and then led a parade of kids from the stage over to the Kid Zone, run by the Denver/Boulder 2010 JCC Maccabi Games Team. 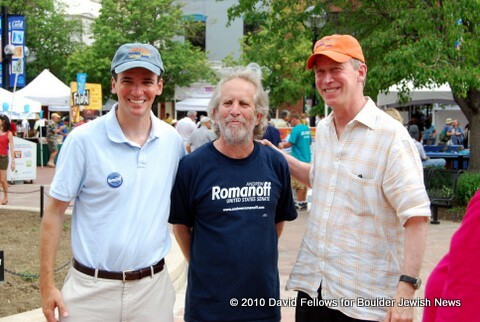 Andrew Romanoff (l) and Denver Mayor John Hickenlooper (r) with Romanoff supporter. The Festival was on Romanoff ‘s published campaign schedule for the afternoon on his Revisit Colorado tour, and Hickenlooper told the BJN that he had time in his schedule between Boulder meetings, and wanted to check out the Festival. Hickenlooper and Romanoff spent a bit of time talking to each other and drawing fans in the process. Among the organizations putting in their first appearances at the Festival were Tuv Haaretz, a local CSA group, and Limmud Colorado, appearing after their third successful annual program over Memorial Day Weekend. Click here to read the Camera’s Festival story featuring the dill pickle demonstration. For more pictures, please visit the Boulder Jewish Festival site later this week. Have a great Festival story to share? Leave a comment below – or write a full post! Previous See you at the Festival!